The years of feud between Apple and Android has affected many people. For instance, you cannot have the iTunes movies, either rented or purchased, played on your Android devices. In response to the issue, this guide will introduce an easy solution that allows you to play iTunes movies on Android easily by converting them to a format that can run on Android phones or tablets. Prior to the detailed guide, let's move to the reasons why to convert iTunes movies to Android. 1. Movies in iTunes store are available for rental or purchase, with a price tag ranging from $2.99 to $14.99. By importing iTunes movies to Android device, the problem of unnecessary waste of money on the movies you've paid can be solved once and for all. 2. The iTunes rentals or purchased movies have their time expiration. To be specific, you have 24 hours only to finish watching the movie after hitting the play and it will expire in 30 days and disappear even if you purchased the movie from iTunes store. So if you want to play it on your Android anytime, you will need to convert iTunes movies to Android compatible format beforehand. 3. Music videos, TV shows and movies in iTunes store are usually saved in M4V formats that are opposite to Android. This is also one major factor causing iTunes movie playback problem on Android. But such limitation can be resolved via a program with ability to convert iTunes movies to a format playable on Android phones or tablets. As is mentioned above, Apple uses M4V files to encode TV shows, music videos and movies in iTunes store. But such videos are protected by DRM FairPlay policy, which means you cannot watch these iTunes movies on Android gadgets like HTC, Samsung, etc but iPhone, iPad and iPod. So you have to find an app that can both Unlock protection from iTunes videos and transfer to Android supported format. Fortunately, MacX Video Converter Pro fits the bill. Its built-in screen recorder and video converter help you Unlock protection from M4V videos and import any DRM-ed iTunes movies to Android devices, be it HTC One, Samsung Galaxy S4, Galaxy Note 2, Asus phones or Huawei pads. Below is step-by-step guide on how to convert iTunes movies to Android with high quality for playback anytime anywhere. 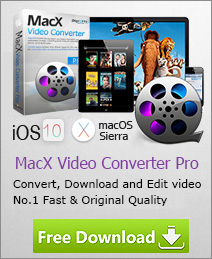 Free download iTunes to Android converter on Mac, hit the "Screen Recorder" button on the main interface. Tips: Please do remember to choose "Add recorded movie to convert list" to add the recorded iTunes movie to the convert list if you want to convert iTunes movies to Android. Hit "Record" button, the program will start capturing iTunes movie on your screen within a few seconds. Once you finish the screen recording, the DRM will be automatically removed from the iTunes video on your Mac. Step 4: Choose Android Device as Your Output Format. By default, the recorded M4V video is saved in MOV format on the main window. And a preview window will pop up for you to select a specific output video format. Here you only need to select the Android phone or tablet from the device list. For example, you can choose to add iTunes movies to Android mobile HTC One for playback thereon. Step 5: Select the Destination Folder. Step 6: Press the "RUN" Button. With the above steps done, please click the "RUN" button to begin transcoding iTunes movies to Android device. After the process is over, you can eventually transfer iTunes purchases to non-Apple devices and watch iTunes movies on Android. 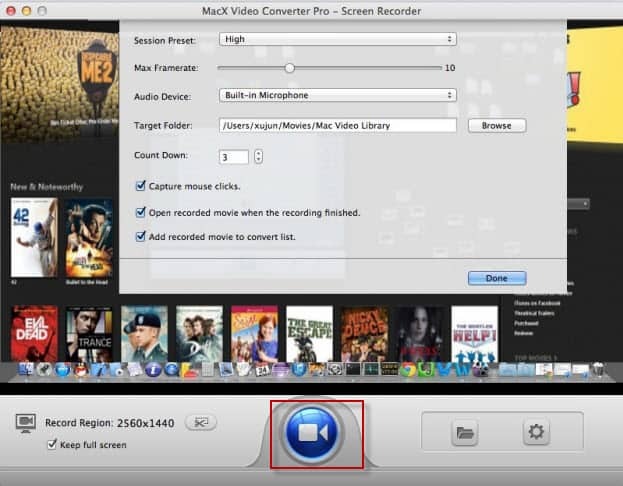 Tips: MacX Video Converter Pro allows you to not only convert iTunes movies to Android phones and tablets, but also transfer HD video like AVCHD MTS M2TS MKV to iPhone, iPad, HTC, Samsung, PSP, Xbox, Google Nexus 7, Kindle Fire HD, etc without further ado. To Unlock protection from iTunes movies on Mac can be an easy task as long as you have a DRM removal tool. MacX Video Converter Pro is the ultimate solution to remove iTunes DRM and convert/import iTunes movies to Android and other devices on Mac for offline playback. 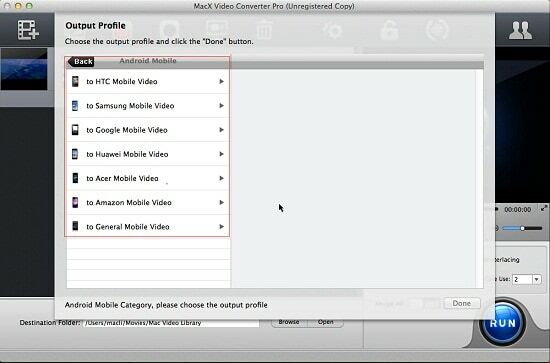 The tutorial focuses on the solution to convert video to HTC One readable format in a snap. With the best HTC One video converter in hand, you can play FLV MOV M2TS MP4 AVI MKV videos on HTC One limitlessly with optimal quality.